Mossdeep City is where you find the seventh Badge, as well as a few other useful items. Be sure to visit the northeastern house to obtain the Super Rod, as well as the northwestern one for HM08 (Dive), which will allow you to explore more of Route 124 and routes ahead. You can also find a Net Ball in the southeast corner, and a boy outside Steven's house will give you a King's Rock. Go inside the Space Center to get the Sun Stone, which will allow you to evolve certain Pokémon. There are Psychic-Type Pokémon in this Gym. Tate and Liza are incredibly hard to defeat, with Pokemon that are quite high-leveled. Not just that, but they're the only Gym Leaders who fight in a Double Battle, and the only Gym Leaders with proper strategies. Lunatone uses Light screen and Reflect to reduce damage, while Solrock uses Sunny Day,and then a one-turn Solarbeam or a boosted Flamethrower.Because of this, and Levitate, from Solrock and Lunatone's weaknesses of Steel, Grass, Water, Dark, Ghost and Bug their aren't any perfect counters, as Water, Grass, and Dark all depend on their powerful Sp.Defense, and Flamethrower will certainly get rid of Steel and Bug types. 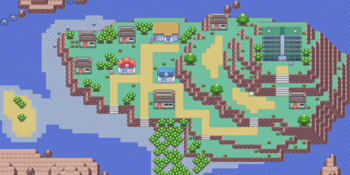 This leaves Ghosts, and there are hardly any Ghosts in Hoenn. In Emerald, with Claydol and Xatu as well, it's even harder.But remember that Surf works well here, hit both foes and being Super-Effective against Solrock, Lunatone and Claydol. This page was last edited on 25 November 2018, at 20:33. This page has been accessed 107,469 times.